Sales of automotive electronic systems are forecast to increase 7.0% in 2018 and 6.3% in 2019, the highest growth rate in both years among the six major end-use applications for semiconductors. 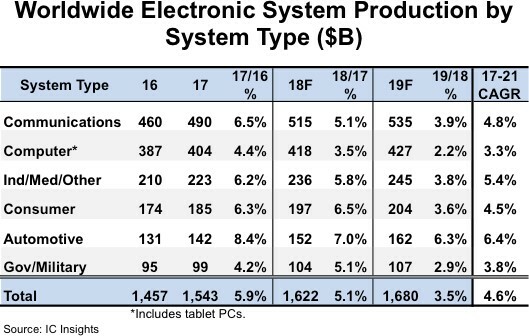 Figure 1 shows that sales of automotive-related electronic systems are forecast to increase to $152 billion in 2018 from $142bn in 2017, and are forecast to rise to $162bn in 2019. Furthermore, automotive electronic systems are expected to enjoy a compound annual growth rate (CAGR) of 6.4% from 2017 through 2021, again topping all other major system categories, based on recent findings by IC Insights. 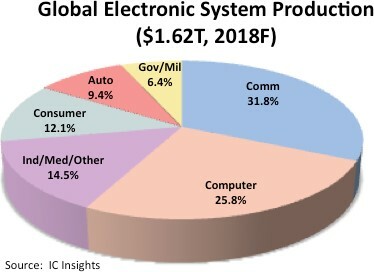 Overall, the automotive segment is expected to account for 9.4% of the $1.62tn total worldwide electronic systems market in 2018 (Figure 2), a slight increase from 9.1% in 2017. Automotive has increased only incrementally over the years, and is forecast to show only marginal gains as a percent of the total electronic systems market through 2021, when it is forecast to account for 9.9% of global electronic systems sales. Though accounting for a rather small percentage of total electronic system marketshare in 2018, (larger only than the government/military category), automotive is expected to be the fastest-growing segment through 2021. Technology features that are focused on self-driving (autonomous) vehicles, ADAS, vehicle-to-vehicle (V2V) communications, on-board safety, convenience, and environmental features, as well as ongoing interest in electric vehicles, continues to lift the market for automotive electronics systems, despite some highly publicized accidents involving self-driving vehicles this year that were at least partly blamed on technology miscues. New advancements are more widely available onboard mid-range and entry-level cars and as aftermarket products, which has further raised automotive system growth in recent years. In the semiconductor world, this is particularly good news for makers of analogue ICs, MCUs, and sensors since a great number of all of these devices are required in most of these automotive systems. It is worth noting that the Automotive—Special Purpose Logic category is forecast to increase 29% this year—second only to the DRAM market, and the Automotive—Application-Specific Analogue market is forecast to jump 14% this year—as backup cameras, blind-spot (lane departure) detectors, and other ‘intelligent’ systems are mandated or otherwise being added to more vehicles. Meanwhile, memory (specifically, DRAM and flash memory) is increasingly playing a more critical role in the development of new automotive system solutions used in vehicles.